"The artificial greenery can be used indoors and outdoors. Perfect for building a living wall, privacy fence or disguising areas such as air condition, stained walls, or chain link fence. Can be used for special events such as weddings, reception party, festival, garden and stage decoration. For home, outdoor patio or balcony backyard decor: doorways, windows, porch, archways, pergola, trellis, gazebos, handrail, stairway railings and etc. " 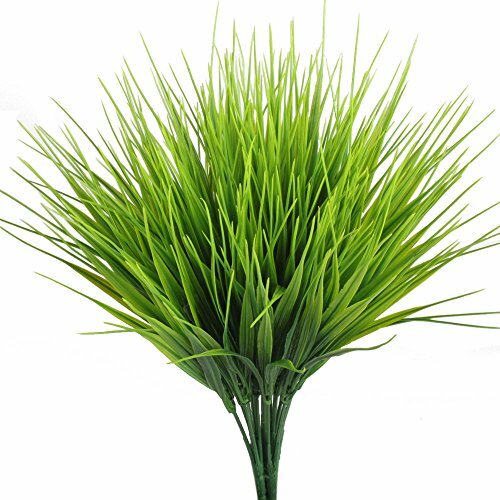 CATTREE Artificial ShrubsThis wheat grass is wired, easily bendable, perfect for outdoor arrangements.Use this vibrant green wheat grass to create a colorful centerpiece for outside decor!This is a artificial green plant, which is constructed of plastic.Will never die off so that it can be a nice decoration for a long time.High quality plastic material is eco-friendly and hassle free without watering and trimming.Length:14 inches / 36 cmLeaves Color: GreenWarm Tips:1.Since the size above is measured by hand, the size of the actual item you received could be slightly different from the size above. Meanwhile, please be reminded that due to lighting effects, monitor's brightness / contrast settings etc, there could be some slight differences in the color tone of the pictures and the actual item.2.When shipped, each bundle are putting close in order to reduce space. Customers can adjust the branches to the most natural state.As pretty as they are lifelike. Suggest mixing and matching with other CATTREE Artificial Flowers to get the best effect. CATTREE sincerely wish you have a happy shopping! Looking to update your outdoor space? Shrubs make exquisite accents or focal points in your landscape design. Perfect Decoration: It can be used as foundation plantings for many gardens , or even backdrops defining garden beds and adding interest to it. Make your walkway, pathway, staircase standout by bordering our beautiful greenery shrubs plants. Low-Maintenance and never wilt, our vibrant greenery shrubs plants are the perfect plant to make hedges of, Faux greenery shrubs plants comes in cool colors and cool colors when used near the borders and fences, create an illusion of enlarged space. Feature：pack of 8pcs . Faux greenery shrubs plants as picture show , 7 stems each bunch. (not including vase) Material: Harmless 100% SAFE ,ECO-Friendly Plastic,Fabric Tip: Because of the faux plant is made with plastic, so there maybe will have some smell. Please put the plant placed in ventilated place for 1-2 days. Attentions: Item color displayed in photos may be showing slightly different on your computer monitor since monitors are not calibrated same. When shipped, each bouquet are putting close in order to reduce space. Customers can adjust the branches to the most natural state. Package includes: A set of 4 potted plants, including 2 green grass and 2 green Melaleuca. 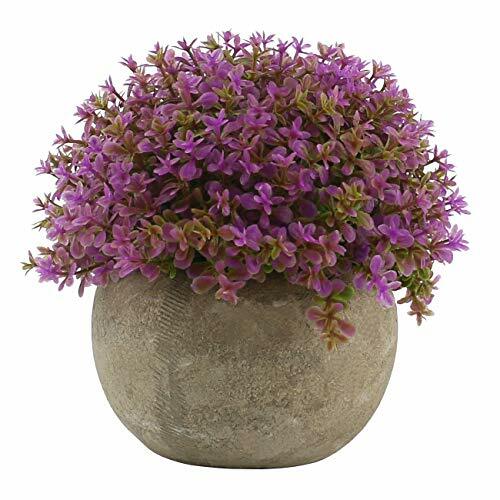 Dimensions: Diameter: 4.3 in; Height: 4.7 in (from plant top to pot base). Features: Selected materials: grass and leaves are made of high quality PE plastic for easy care. The flower pots are made of grey paper pulp, strong and durable, not brittle, but do not put them in water. 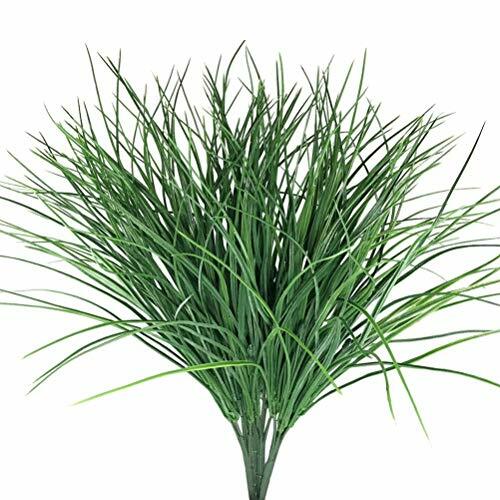 High-grade quality: Made of high-quality pure plastic, it is exquisitely crafted and more realistic than other simulated plants on the market. No need for maintenance or care, they will neither wither nor fade. Multiple functions: can be used as decorations for furniture and office environment. You can easily enjoy the beauty of nature in the bedroom, living room, bathroom, kitchen, balcony, bookshelf, foyer and other places. 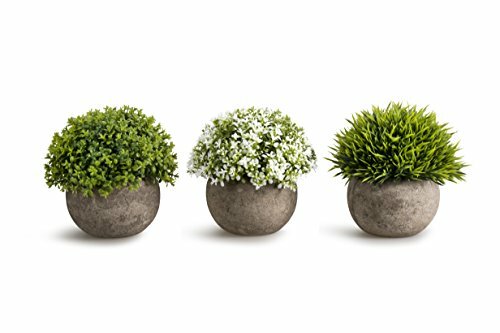 The best choice: These lifelike artificial potted plants can bring green life and freshness to your living space. The perfect gift for life. Customer service: If you have any questions about our products, you can click the "Contact Seller" button to send us an email and we will reply in a timely manner. Thank you! - Still don't know how to decorate your office or home? - Still confuse what gifts can delight your family, friends or lovers? - Come and see it! 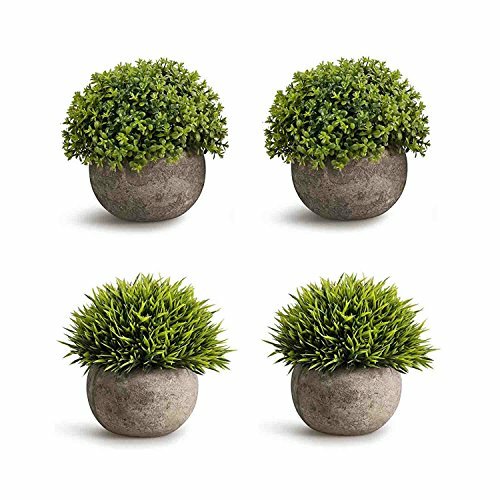 - OPPS Mini Artificial Plants Set can be your PERFECT CHOICE! 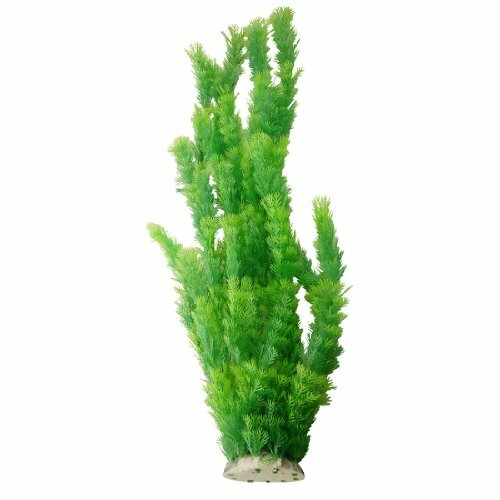 Color: Green / Mixed PACKAGE CONTENT: 3 X OPPS Mini Artificial Plant (4.3"W*4.7"H) We do provide 100% OPPS Satisfaction Guarantee and back up with 60 days warranty (defection, accidental damage, non-satisfaction), so don't worry about the problem of transport damage. If you are still have any questions, please contact me in time! We cannot guarantee this sale price for long - Be Sure To Click "Add to Cart" Now! 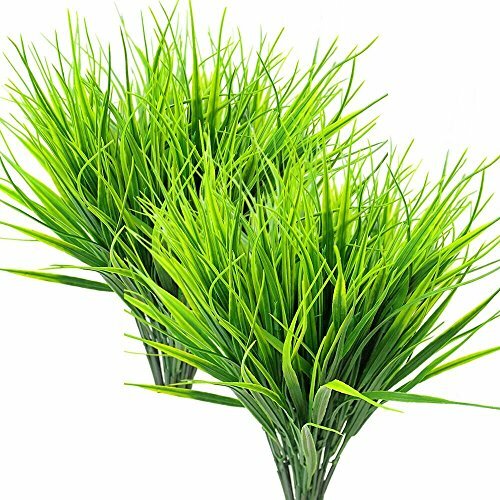 Real touch feeling grass leaf bunch artificial flowers greenery evergreen plant for any occasion centerpieces decorative greenery This full and luscious faux wheat grass bush in green is wired, easily bendable, perfect for outdoor arrangements. Use this vibrant green bush and silk flowers to create a colorful centerpiece for outside decor! 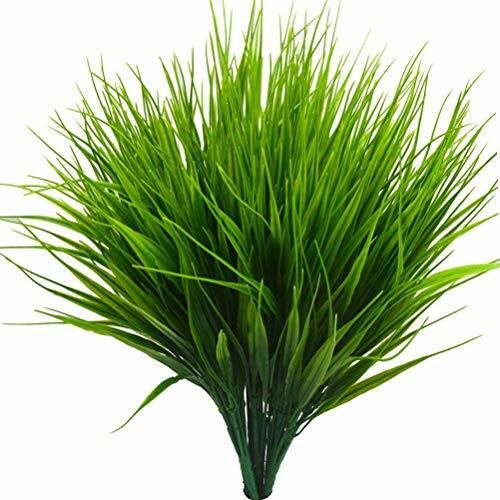 This is a artificial green plant, which is constructed of plastic and fabric material.Unlike this real plants This silk grass will never die off, and easy take care of it. 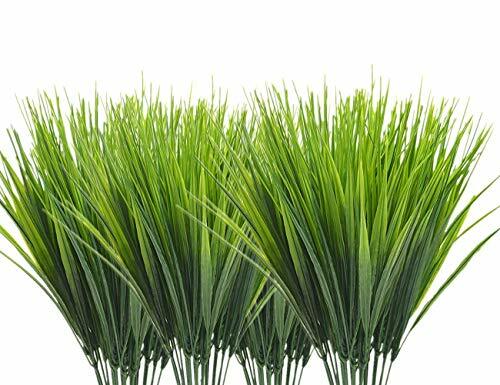 so that it can be a nice decoration for a long time Package Content: 4 x Artificial Plastic Wheat Grass Material: Plastic,Fabric Type: Plant Length:14.37 Inch Leaves Color: Green Tip: Because of the faux plant is made with fabric and plastic, so there maybe will have some smell. Please put the silk plant placed in ventilated place for 1-2 days or wash them with warm water Note: Since the size above is measured by hand, the size of the actual item you received could be slightly different from the size above. Meanwhile, please be reminded that due to lighting effects, monitor's brightness / contrast settings etc, there could be some slight differences in the color tone of the pictures and the actual item. Specifications Size: 4.7"Height Material: Plastic, Clay pot Color: As picture show Package include:1PCS Mini Plastic Artificial Plants 100% brand new and high quality. Performance This tiny green grass ball offers the best of both worlds. Realistic in color and texture, it brings the lush beauty of the outdoors to your home without the hassle and worry of maintenance. Its charming ceramic-like pots give it a touch of rustic style, but its design is versatile enough for any decor. Gives indoor homes a touch of greenery. Great centerpieces for any table, or great displays for your shelves or mantle. Bring the botanical garden feel into your home without any of the maintenance. These make beautiful tabletop ornaments around the house, kitchen, bathroom, bedroom, living or dining room. Makes a great centerpiece accent! You can even take them outdoors to display on your porch! Flowers and Leaves are made of plastic, easy for care. Comes with gray paper pulp pots, please do not put the pots in the water. Shopping Results for "Plastic Artificial Grass Plant"